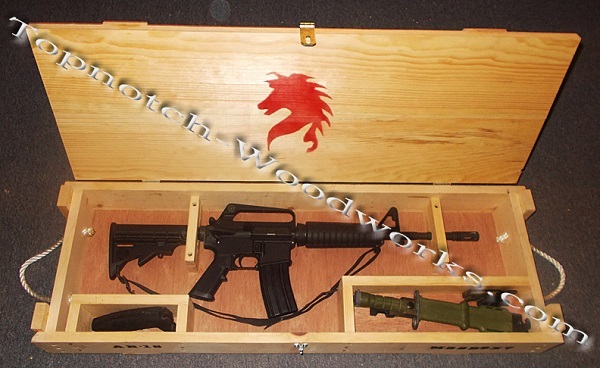 The AK47 Wooden Shipping Crate from Topnotch Woodworks is the way to display your rifle in an authentic military style shipping crate. Can be customized to match rifle logos from across the world. 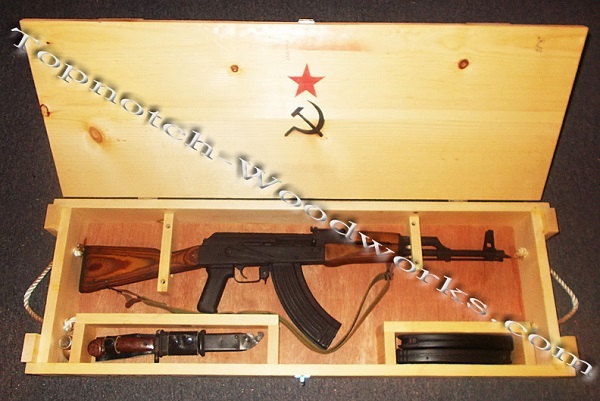 This AK 47 Wooden Shipping Crate is handcrafted right here in the USA by a former 20 year USAF Veteran. Built in knotty pine lumber and unvarnished, this crate holds your rifle, bayonet, oil can, and two magazines. Display area dimensions are 13 1/2 x 40. We can customize the design just about any way you would like, making it completely to your design. You design the interior and exterior and we will ensure you will have a Topnotch AK47 Wooden Shipping Crate ready for display. Add a hammer and sickle design, 7.62 mm, and AK47 painted letters. We can change the logo to match any rifle maker. **Display crate is NOT a “Security Safe”, but merely a way to display your weapon. It is YOUR responsibility to secure all weapons and keep them SAFE and out of the hands of anyone not trained to handle them.